On October 27th & 28th, at our annual Halloween Tournament, the Solivita Smashers celebrated the life and loss of a member who was very instrumental in the formation of the club and a great friend to all. Carl Clous died of cancer this year and was remembered by his fellow club members and Carl also served as our representative to the USAPA. "The 2012 Carl Clous Halloween Tournament" and "Team Smashers Kick-Off Celebration for the American Cancer Society's 2013 Relay for Life." 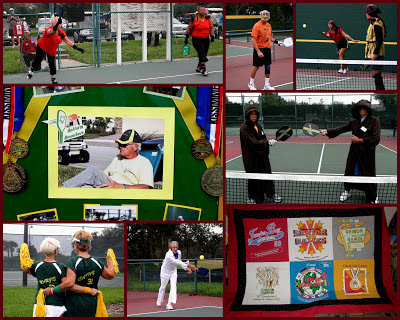 The Smashers also had a raffle for three quilts made from various Pickleball tournament shirts. The proceeds went towards a $750 scholarship for a needy student from our local high school. A great two days of pickleball and fellowship was had by all.